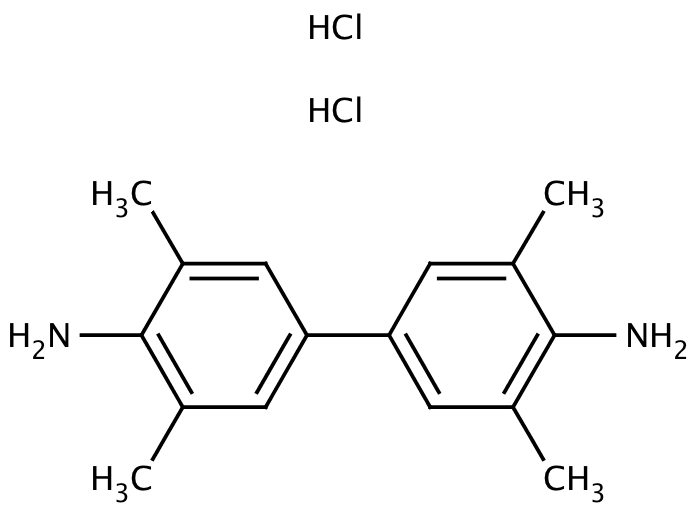 TMB is an excellent colorimetric substrate for detection of horseradish peroxidase labelled probes and is used with peroxidase and peroxidase coupled systems, particularly in ELISA techniques. It produces a soluble end product, which is blue in color and can be read spectrophotometrically. TMB has also been used in the quantitative determination of hemoglobin and in cytochemical staining for peroxidase. TMB is a hepatitis B antigen. Send us your enquiry for 3,3’,5,5’-Tetramethylbenzidine Dihydrochloride Hydrate. We offer custom pack sizes at special prices. We aim to respond to your enquiry within 24 hours. We value your input so if you have suggestions regarding new applications for 3,3’,5,5’-Tetramethylbenzidine Dihydrochloride Hydrate email us and we will include your contribution on the website.